When Luke Skywalker loses his right hand, he chooses to get a robotic hand rather than learn to swing a lightsaber left-handed. He's lucky to live in a universe where a prosthesis can perfectly replace a human hand. After Jaime Lannister suffers a similar loss in A Song of Ice and Fire, the Kingslayer struggles for years to learn how to fight with his left. In all the other worlds of our fiction, the right hand remains the default choice to swing a sword, whether it's made of iron, laser, or dragon-steel. Hand dominance is such an integral part of human life, it's a rare writer who creates an alternate world full of humans or as-good-as-humans who use both hands equally. It's good that nobody writes those worlds, because humankind without handedness would be a completely different creature. About nine out of ten people prefer to use their right hand, and that ratio has remained unchanged across continents and millennia; everything from Neolithic cave art to the Dutch masters shows that about ninety percent of humans use their right hands to hold tools and weapons. The ubiquity for right-handedness go back at least to Neanderthals, if not further. However, birds and monkeys and other animals have a fifty-fifty split; each individual has a preference, but lefties are as common as righties. We don't know for certain why humans are so uniquely asymmetrical, but we think it's a side effect of the evolution of language, which is specialized in the left hemisphere of the brain. Speech and manual dexterity both require fine motor skills, so as the left side of the brain became the primary site for language mechanisms, so too did it become the dominant hemisphere for movement control. Most nerves cross in the brainstem, so a movement-control advantage for the brain's left hemisphere means right handedness. Just as we don't know why most humans are born right-handed, we don't know why some are born left-handed. Hand dominance must be genetic, since the ten percent ratio persists even in cultures that forbid left-hand use. But if left-handedness provided some evolutionary advantage (or disadvantage) to the individual, we'd expect to see that ratio vary across the millennia. However, left-handedness can't arise from simple inheritance, since less than half of left-handers comes from families with many left-handers. Besides, only about half of left-handers have a family history of left-handedness. If it's not simple genetic inheritance, what else? Once again, we can only guess, but our best hypothesis is a population-level evolutionary pressure that favors the ten percent ratio. Perhaps a group of humans does best when most of its members move alike, with just enough exceptions to provide variety. Figure 1. When you recruit equal numbers of "right-handers" and "left handers," it becomes clear that the so-called "left-handers" include ambidextrous and weakly-right-handed individuals. Courtesy Hervé et al. 2006, NeuroImage. Of course, we could better understand why left-handers existed if we knew what left-handedness meant. 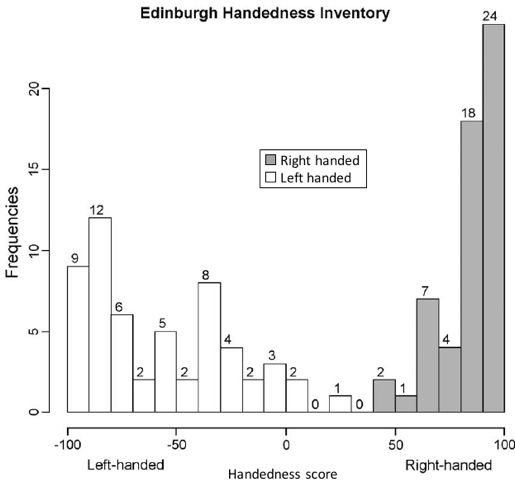 It turns out that handedness falls into two groups, and neither of them is "left-handed." The two true groups are right handed and not right handed. The vast majority of humans are strongly right-handed, but the others aren't just a mirror reversal: instead they're broadly spread across the spectrum, from weakly right-handed to ambidextrous to left-handed. Few left-handers prefer their left hands as consistently as righties do their right. Every time we try to improve our understanding of handedness, the answers recede, only to be replaced by more questions. Why does Luke Skywalker have handedness at all, despite being born in a galaxy far, far away? What makes a human like Matt Murdock left-handed? What are left-handers? For something so fundamental to our everyday lives, handedness is a mystery. But it's the good kind of mystery: the kind where even if we don't get answers, every new question tells us more about the human experience. The further we follow this rabbit hole, the more we learn about the brain, and the rabbit hole goes deep indeed. For example, right hand dominance doesn't mean your right hand is better at everything. Jaime Lannister's right hand could wield his sword with greater strength and precision, but his left hand was probably better at holding his shield, and not just because of practice. According to a modern idea called the "dynamic dominance hypothesis," each side of the brain is better at different kinds of movements. If you're a righty, the left side of your brain (and thus your right hand) is better at precision and speed, but the right brain (and left hand) are better at stabilization and responding to surprises. When you tuck a package into your left elbow while you unlock your door with your right hand, you're doing that not only because your right hand is nimbler with the keys, but also because your left arm is better at balancing the packages. If you're a writer, the dynamic dominance hypothesis can help you better depict what happens after a brain injury. Strokes and physical injuries often affect only one side of the brain, and an uninformed writer might make the character slow, clumsy, or paralyzed on the opposite side of the body. But in the real world, the consequences get more complex. For a righty, the right hand is good at speed and precision because it has a better connection to the speed-and-precision mechanisms on the left side of the brain. When you do delicate work with your left hand, you use the same left-brain speed-and-precision mechanisms. That means if a character gets an injury to the left side of their brain, their right hand would get paralyzed or weakened—but they'll get worse at precision movements with both hands. In other words, one part of your brain has the precision control mechanisms; your dominant hand has a better connection to that machinery, but both hands use the same mechanism. Figure 2. The Ebbinghaus illusion. 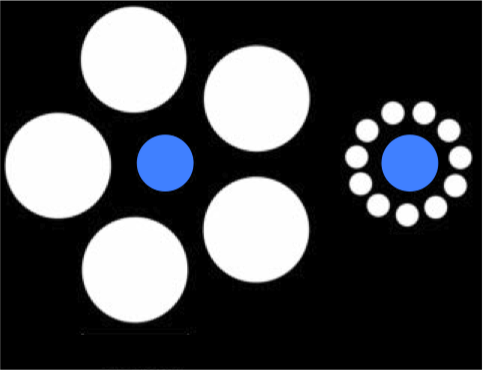 The two blue circles are identical, but to most people, the one on the right seems larger. Now that we've broken down the myth that handedness means your dominant hand is better, let's see how far it goes. Beside this text you'll see an image called the Ebbinghaus optical illusion. You may have seen it before: the blue circle in the middle seems larger when surrounded by small circles, even though the two blue circles are identical. But if you make a person reach out and pick up those blue circles, you can watch how their fingers respond to the illusion. (Every time you pick something up, your fingers start "pre-shaping" at the start of your reach.) As it turns out, your fingers aren't affected by the illusion. That is, your right hand isn't affected by the illusion . . . regardless of whether you're a lefty or a righty. How is that possible? Because the human brain has multiple asymmetries for movement control. This one is about the split between vision-for-perception and vision-for-action. Vision-for-perception is about names and identities; it helps you distinguish pliers from wire strippers, and thus know which one to request and where to look in the toolbox. Vision-for-action is about where your hands go; it helps you figure out the exact position of those pliers, so you can wrap your fingers around them for a sturdy grip. Vision-for-perception is the conscious side, full of abstractions and ideas, and susceptible to optical illusions. Vision-for-action deals in real spatial coordinates and is unaffected by optical illusions. Some parts of this illusion-proof vision-for-action-system are specialized to the left side of the brain, regardless of whether you're a lefty or a righty. These two asymmetries are unrelated: if you're left-handed, movement-precision might flip to the right side of your brain, but the left side stays specialized for vision-for-action. Data from Star Trek: The Next Generation preferred his left hand, but he could perform equally well with either hand. Can we too someday surpass the limitations of handedness? In the real world, technological advances have let us surpass the apparent limits of human biology again and again. Our capacities already outstrip anything imaginable a century ago, especially in the physical domain, and we break new athletic records every year. (Nutrition alone contributes greatly to this—in World War I, Nordic soldiers were famous for being short.) In 2017, we can already see the first glimmers of human genetic modification and cybernetics. These technologies promise new frontiers in human modification, but in my opinion, none of them will eliminate handedness from humankind. To understand why, let's delve into the possibilities of cybernetic enhancement. The first human cyborgs already exist. Not just people with cochlear implants or pacemakers, but paralyzed patients with chips implanted in their brain so they can use their thoughts to control a computer or a robotic limb. Right now these brain-machine interfaces are in early-stage clinical trials; control is clumsy and slow, but with the added insight from years of primate research, we understand the basic principles. A fully functional cybernetic prosthesis has to understand both the goal of your movement and how you want to execute it. Goal without execution would feel like having a button-controlled servant: I can tell it to turn on the light switch, but it won't seem like I'm the one doing it. A useful tool, but not a Luke Skywalker-level space opera prosthesis that works as deftly as a biological hand. Both kinds of information—goal and execution—are part of the brain's movement control systems. Every fold and valley of the brain are involved in movement, with all the handedness it entails. The brain is not a computer; the metaphor is useful, but limiting (for further discussion, see my article in Clarkesworld here). Rather than a general-purpose Turing machine, the brain is better viewed as a system evolved to control the movements of the human body, to produce actions that improve our ability to survive and reproduce. That's why handedness is tied to language, and to optical illusions; the brain is all one system for movement, from finger control to the lip-movements of speech, and even down to the memories that help us select which actions to take. And if the whole brain is a movement system, to change the way we move means changing the whole brain. We humans are a product of our specific evolutionary history, with all the pressures and trade-offs along the way. A brain of different function would experience the world in a completely different way. To eliminate handedness would require rewiring the entire brain. We'd have to rebuild our language faculties from a mostly-one-hemisphere activity to one distributed across both hemispheres—which is as implausible as redesigning an engine to be evenly distributed across the entire car. We'd have to change up how the vision-for-action mechanisms separate out from vision-for-perception, which would mean a top-to-bottom rebuild that includes all four lobes of the brain. Despite the immensity of these challenges, with sufficient space-opera level technology we might someday be able to let people use either hand with equal dexterity and stability. But to change a living brain so drastically is the same as destroying it and replacing it. I believe even ancillaries present an optimistic case. If future humans radically rebuilt brains or developed vat-grown soldiers to be perfectly ambidextrous, those soldiers would have brains organized in a way wholly unlike the brains of modern humans. We might call these vat-grown creations "humans" for ethical reasons, and they might be able to act like us on the outside, but their consciousness and experience would probably be drastically different from the humans of the early twenty-first century. As future humans gain technological control over the design of their brains, we might all choose to leave behind the evolved brains of old, and become something new. Perhaps our descendants will have drastic genetic modifications, or be artificial intelligences created from whole cloth. They might still have language, creativity, memory, social coordination; even if their minds are unlike ours, once you're free from the constraints and history of evolution, there are many possible mechanisms to produce a behavior. At that point, they'd no longer have any need for handedness. But until that possible day when we can carve away the legacy of evolution and craft ourselves anew, our brains will remain saturated with the causes and consequences of handedness. Data was built to emulate humans, but Dr. Noonien Soong created a humanlike mind from scratch, rather than reinventing the human brain. As a result, Data lacked true handedness. If we tried to emulate his movements, our struggles would outmatch all his difficulties with human emotions. 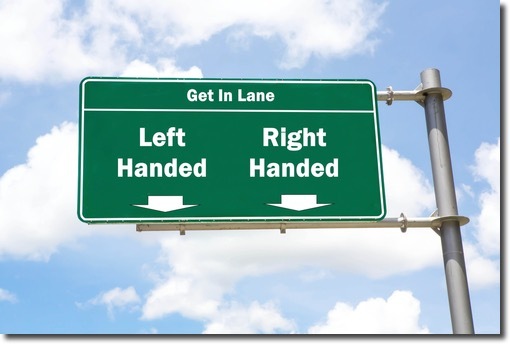 Unless we decide to tear down the scaffolding of evolution and start our species anew, no amount of genetic or cybernetic modification will take away the differences and similarities between right-handers and left-handers, or eliminate the influences of dynamic dominance and optical illusions. Real hand dominance, with all its complexities, arises from the very heart and bones of the human brain. Even in a galaxy far, far away, to think and act like a human means to have handedness. Benjamin C. Kinney is a neuroscientist at a major American university and a writer of science fiction and fantasy. His areas of research include how the brain’s mechanisms of handedness interact with nerve injuries and rehabilitation. He’s the assistant editor of the science fiction podcast magazine Escape Pod, and his fiction has appeared in Strange Horizons, Flash Fiction Online, Compelling Science Fiction, and more. He lives in St. Louis, Missouri, with two cats and a Martian wife. You can find him online at benjaminckinney.com, or follow him on twitter @BenCKinney.